Combat was, for many people, the first Atari 2600 game they ever played, as it was packaged with the system from 1977 to 1982, until it was replaced with Pac-Man. Combat is a two-player only game where each player takes control of a combat vehicle; either a tank, a bi-plane, or a jet. For two minutes and sixteen seconds, the players shoot at each other and try to score the most hits before time runs out. Combat is the home presentation of a few Atari arcade games that were available at the time of the 2600s release, including Tank and Jet Fighter. Tank was actually distributed under the publisher name Kee Games, which was a company that Nolan Bushnell purposely created to "compete" with Atari (they routinely shared technology and information) for the expressed purpose of breaking up the exclusivity that arcade distributors had with arcade publishers at the time. Naturally, as a first generation game on a first generation console, Combat is noticeably primitive. Despite the aged look that it has, it is still surprisingly fun to play with another player, since you are pit against another human being, not the computer. The controls are simple and easy to comprehend. 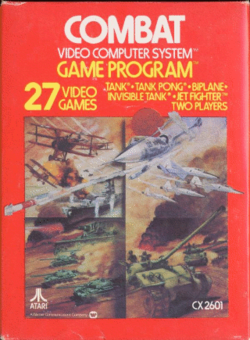 Combat was released as Tank-Plus under the Sears Telegames label. Left/Right Difficulty Switch: If set to A, the left/right player will have a shorter bullet range in Tank games, and fly slower in Bi-plane or Jet games. Game Select: Select a game variation. The variations cycle from 1 to 27 and start back over at 1. See the Game Variation chart below. Game Reset: Starts a new game in whatever game variation is currently selected. Both players' scores are reset to 0, and the timer starts over. The tank will stand still if the joystick is left in the neutral position. Press the button to fire a missile from the tank. Only one missile per player can occupy the screen at one time. The Bi-plane will fly continuously at medium speed if the joystick is left in the neutral position. Press the button to fire a bullet from the bi-plane. Only one bullet per players' planes can occupy the screen at one time. The jet will fly continuously at medium speed if the joystick is left in the neutral position. Press the button to fire a bullet from the jet. Only one bullet per players' jets can occupy the screen at one time. Whether the tanks are visible or invisible. Whether the missiles fly straight or can be guided. Whether the missiles stop at walls or ricochet (Tank-Pong). If the missiles ricochet, whether players can be hit by direct shots or not. Whether the play field is open, or whether there is a simple maze in the field or a complex maze. Invisible Tanks: When tanks are invisible, they cannot be seen when they are motionless or moving about the play field. A tank will become momentarily visible whenever a player fires a missile, or when a player is bumping into a wall. Guided Missiles: When playing a guided missile game, the trajectory of the missile is influenced by the rotational movement of the player. If the player rotates clockwise, the missile's path will bend in a clockwise direction. In this manner, a player can fire a shot and cause it to curve around a barrier in an attempt to hit a player on the other side. Tank-Pong: In Tank-Pong, the missiles do not stop when they hit a wall. Instead, they will ricochet off the wall and continue moving on until the missile has accumulated a certain total distance. Some variations of Tank-Pong only allow players to shoot each other if the missile has ricocheted off of at least one wall. Missiles fired directly at another player will not score a hit in these variations. Mazes: The decision to use a maze or not drastically impacts the strategy that players will employ while playing a game. In an open field, there is no place to take cover, so each player is equally vulnerable at any given moment. With a maze, whether simple or complex, each player can reduce their vulnerability (as well as their offensive advantage) by using some of the walls of a maze as cover. Whether bullets fly straight, can be guided, or can be fired in rapid succession. Whether the entire sky is visible, or it's partially obscured by clouds. Whether both players have one bi-plane or not. Bullets: Bullets can be fired in one of three modes. They can be fired straight; they will continue to fly in the direction they were fired in. They can be guided; the bullets path can be bent by the rotation of the player's plane (same as tanks). Or they can be fired in machine-gun mode; they fly very fast, very short, and appear in rapid succession. Clouds: Choosing a play field with clouds does nothing to affect the gameplay beyond obscuring the location of the biplanes and bullets that pass behind them. Players can use the clouds strategically to surprise one another with shots fired from within the clouds. Numbers of bi-planes: The first four variations provide each player with only one bi-plane. Game variation 19 provides both players with a pair of bi-planes that fly and shoot together. Game variation 20 provides one player with a bomber, the width of three bi-planes, while the other player pilots three regular sized bi-planes. The large bomber fires an equally large bullet, while the three bi-planes fire three shots (which technically gives that player the advantage.) Choose variation 20 when one player is significantly better than another. Whether the bullets fly straight or can be guided. Whether both players have one jet or not. Guided bullets: When playing a guided bullets game, the trajectory of the bullet is influenced by the rotational movement of the player. If the player rotates clockwise, the bullet's path will bend in a clockwise direction. In this manner, a player can fire a shot and cause it to curve in an attempt to intersect with the other player's path. Clouds: Choosing a play field with clouds does nothing to affect the gameplay beyond obscuring the location of the jets and bullets that pass behind them. Players can use the clouds strategically to surprise one another with shots fired from within the clouds. Numbers of jets: The first four variations provide each player with only one bi-plane. Game variation 25 and 27 provides both players with a pair of jets that fly and shoot together. Game variation 26 provides one player with a one jet, while the other player pilots three jets that fly and shoot together. The player with three jets has triple the firepower, but also triple the exposure to the other player's bullets. This page was last edited on 30 May 2016, at 05:09.